One Box of 50 Cartridges: .41 Long Colt, new, loaded with a 200 grain Lead projectile, non-corrosive, make sure ypou pistol is in excellent condition. Case length is 1.3 inches over-all-length is 1.418 inches, rim diameter is .432 inches. 41 Short Colt D.A. (Long Case). 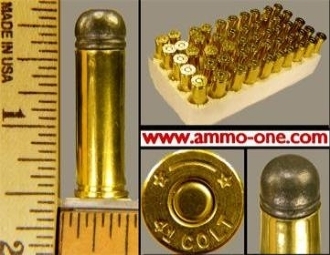 The 41 Colt D.A. ( Double-Action Revolver ) was introduced sometime between 1877 and 1880. After the introduction of the 41 Short Colt in 1884 the 41 Colt D.A. was renamed the 41 Long Colt D.A.. The very early outside lubricated cartridge had a case length of .926"-.955" until the introduction of the inside lubricated cartridge in 1896 when the case length was increased to 1.112-1.131" Both the outside lube and inside lube 41 long Colt D.A. have a case rim diameter on .427"=.436".